The cone is an unnatural shape in the landscape, and half of it drains north, aggravating the drainage problem. I've tried to address these issues in a new variant of the design, longeaves. Firstly, the shape in the landscape. In the first singlespace drawing, the frontage was very stark and basic. The roof overlapped the front edge of the building very little, making the geometric regularity of the fenestration very obvious. I tried to address that in the second drawing by extending the front eaves out from the building, but I still did this with rotational symmetry, and it still looked, in my opinion, very artificial. 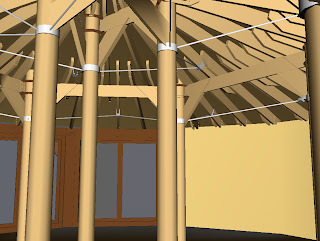 Considering the need to add additional space - somewhere where, in the longer term, a water closet might be installed, and also somewhere where bikes, firewood and other outdoor stuff could be stored - led me into reconceiving the roof. If one has a conventional building, the most convenient way of adding an additional space is to add a leanto - essentially, a space under deliberately extended eaves of the roof. Well, OK, let's build the roof with long eaves on the sides, deliberately creating additional space. Let's build the retaining wall to accommodate that space. Suddenly the roof has changes shape; it's no longer a neat truncated cone. Now it has an asymmetric skirt. And if we fair that asymmetric skirt into the main roof in a fluid curve, then we have a shape which does not look quite so artificial in the landscape. The energy costs of doing so are remarkably small; the eaves will not shade the windows at noon, because they are extended only at the sides, nor will they at evening, when the sun is low. I could, of course, build these eave-extensions on both sides of the building, and initially that's what I thought I'd do. However, but the time I'm old enough to need an inside water closet I shall probably be too old to ride a bicycle over the hill, and the shape of the depression in the ground into which I want to put my house will make it easier to have an extension on the west side only. So my present plan is to have only one such extension, arranged for now as an external store but designed with the intention (and thus with the insulation and damp-proofing) which will allow it to be incorporated into the internal space later. Again, increasing the asymmetry decreases the landscape impact by decreasing the obvious artificiality of the shape. 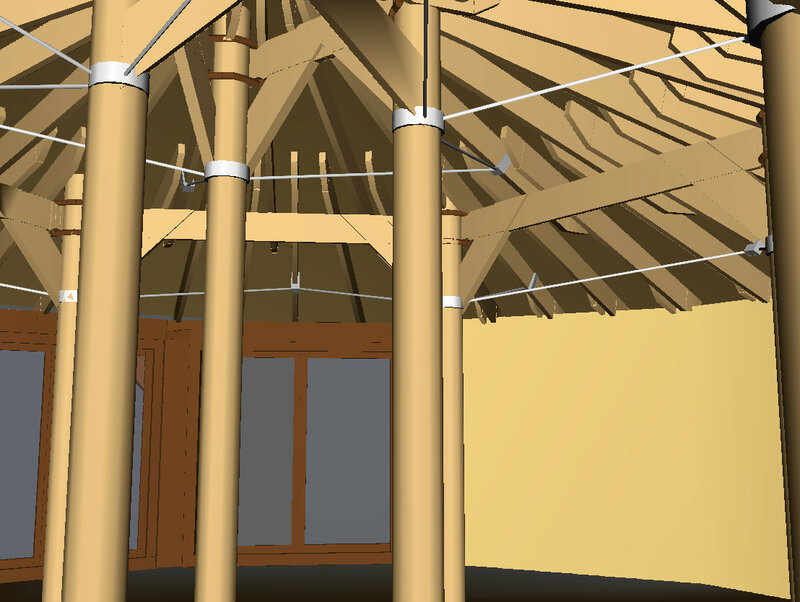 As discussed in the previous essay, the obvious solution to stiffen the roof is to add tensile bracing like the spokes of a bicycle wheel. My aesthetic temptation is to use rope; Hempex brand polypropylene such as I plan to use for the ring beam lashing is sufficiently durable and looks good, but I think the tensile bracing needs to be very, very low stretch indeed, so stainless steel wire with turnbuckles for tightening is probably more sensible. I might compromise and go for steel rod (which would also be cheaper than stainless). These new drawings show how this could be done, and it looks reasonably persuasive. I thought a lot about reshaping the roof to merge it into the hillside better, and I've decided not to. Adding a gable (which would be possible) detracts from the structural simplicity, and thus elegance, of the space; the gable adds cost and complexity, and replaces a cone in the landscape with flat planes in the landscape. Making an irregular shape strong is even more complicated, and adds costs not just in materials but in time. The simple cone isn't a natural shape; but it is a simple shape to build and it does have elegance. And I think that in this version it won't shout in the landscape - particularly if I plant gorse on the roof. This leaves the issue of draining the uphill side. I started with the idea of an underground house. That, in the end, turned out to be too expensive. 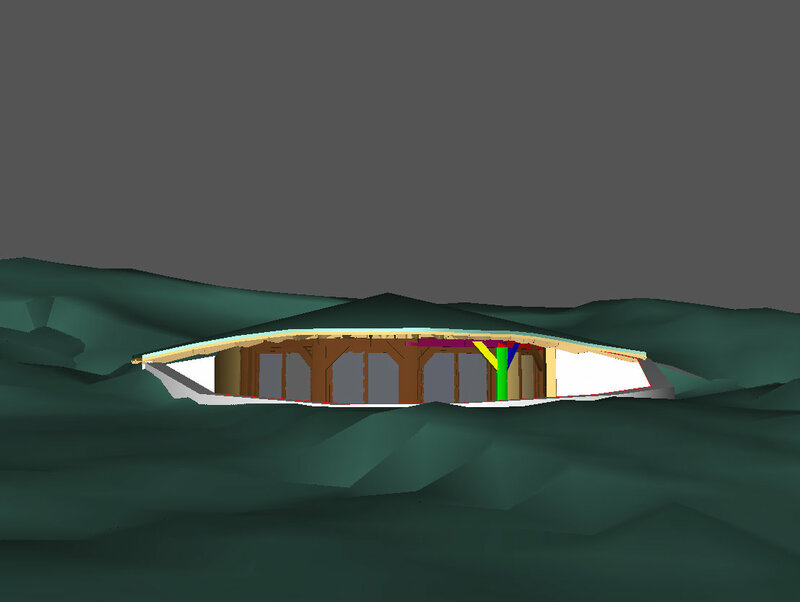 Singlespace still has a turf roof, which makes it less obvious in the landscape, and it's nestled into a natural hollow. The question is, do I dig it back into the hollow and berm natural earth up against the walls? I can do. And there are well documented solutions to draining this sort of design. They aren't absurdly expensive. To be able to walk from the natural hillside onto my roof with no obvious transition seems a good thing to me. And building back into the hillside definitely decreases wind exposure and increases insulation. He's quite possibly right. And, if I went that way, I could use straw bale for the back walls rather than concrete block and polystyrene, increasing the insulation and decreasing the energy cost. It isn't impossible, but I'm very resistant. Digging back into the hillside feels like the only part of my original concept I've got left.